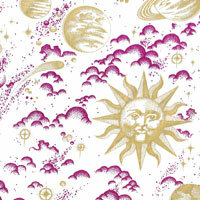 Celestial Designs in Grape Cellophane Roll 24 inches wide x 50 ft long. Design includes the sun, moon, stars, planets and comets in gold. Clouds are grape color. Cello background is clear.